We develop a model to study optimal decision making in the face of uncertainty about the timing and structure of a future event. The model is used to study optimal decision making and welfare when individuals face uncertainty about when and how Social Security will be reformed. When individuals save optimally for retirement, the welfare cost of uncertainty about the timing and structure of reform is just a few basis points of total lifetime consumption. In contrast, the cost of reform uncertainty can be greater than 1% of total lifetime consumption for individuals who do not save. Many believe that people are saving less for retirement due to the shift from defined benefit (DB) to defined contribution (DC) plans. The analysis uses National Income and Product Accounts data, with adjustments, to compare DB benefit accruals with DC contributions from 1984-2012. The results show that the percentage of total salaries going to retirement saving has declined slightly during this period. But if returns on asset accumulations are included, the annual change in pension wealth is relatively steady, so the shift to DC plans has not led to less total saving. What has changed is that individuals, rather than plan sponsors, now bear all of the risk. The 2015 Technical Panel on Assumptions and Methods, which was appointed by the Social Security Advisory Board, has released its report. The report covers a range of issues, both in terms of assumptions and methods and how the results of the Trustees and SSA actuaries’ calculations should be presented to the public. However, the table below summarizes the results of the main assumption changes the panel recommended to the Social Security Trustees. If all were adopted, Social Security’s long-term funding shortfall would rise from 2.68% of taxable payroll to 3.42%. Despite the large and growing returns to deferring Social Security benefits, most individuals claim Social Security before the full retirement age, currently age 66. In this paper, we use a panel of administrative tax data on likely primary earners to explore some potential hypotheses of why individuals fail to delay claiming Social Security, including liquidity constraints and private information regarding one’s expected future lifetime. We find that approximately 31-34% of beneficiaries who claim prior to the full retirement age have assets in Individual Retirement Accounts (IRAs) that would fund at least 2 additional years of Social Security benefits, and 24-26% could fund at least 4 years of Social Security deferral with IRA assets alone. Our analysis suggests that these percentages would be considerably higher if other assets were taken into account. We find evidence that those who claim prior to the full retirement age have higher subjective and actual mortality rates than those who claim later, suggesting that private information about expected future lifetimes may influence claiming behavior. "Defaulting Retirement Distributions Out of Defined-Contribution Plans: A Role for Managed-Payout Target-Date Portfolios"
Default features in defined-contribution plans are designed to improve the retirement security of plan participants. To date, these have focused on the challenge of saving, ignoring the more complex challenge of dissaving. Automatic default provisions for drawing down participant account balances after retirement could be beneficial. Conceptually, the objective is to reframe the Zeitgeist of defined-contribution plans from that of savings plans closer to that of income continuation plans with pension-like features. This could be accommodated though a managed payout feature designed into the plan’s default investment strategy. "Employee Financial Literacy and Retirement Plan Behavior: A Case Study"
This paper uses administrative data on all active employees of the Federal Reserve System to examine participation in and contributions to the Thrift Saving Plan, the system’s defined contribution (DC) plan. We have appended to the administrative records a unique employee survey of economic/demographic factors including a set of financial literacy questions. Not surprisingly, Federal Reserve employees are more financially literate than the general population; furthermore, the most financially savvy are also most likely to participate in and contribute the most to their plan. Sophisticated workers contribute three percentage points more of their earnings to the DC plan than do the less knowledgeable, and they hold more equity in their pension accounts. Finally, we examine changes in employee plan behavior a year after the financial literacy survey and compare it to the baseline. We find that employees who completed an educational module were more likely to start contributing and less likely to have stopped contributing to the DC plan post-survey. "The Intergenerational Welfare State and the Rise and Fall of Pay-as-You-Go Pensions"
This paper develops a theory of the two-armed intergenerational welfare state, consistent with key features of modern welfare arrangements, and uses it to rationalise the rise and fall in generosity of pay-as-you-go pensions solely on efficiency grounds. By using the education arm, a dynamically-efficient welfare state is shown to improve upon long-run laissez faire even when market failures are absent. To release these downstream welfare gains without hurting any transitional generation, help from the pension arm is needed. In the presence of an intergenerational education externality, pensions initially rise in generosity but can be replaced by fully funded pensions eventually. "Does Financial Sophistication Matter in Retirement Preparedness?" Lack of financial sophistication has been suggested as a cause of retirement plan failure. We extend previous studies of retirement adequacy by testing the effect of financial sophistication proxies on projected retirement adequacy, using the 2010 Survey of Consumer Finances (SCF) dataset. We found that only 44% of households with a fulltime head aged 35 to 60 are adequately prepared for retirement in 2010, compared to 58% in 2007. Our multivariate analysis shows that college educated households are more likely to have an adequate retirement than those with less than a high school degree. Households using a financial planner are more likely to have an adequate retirement than those that do not use one. How Much Longer Do People Need to Work? How Does Occupational Access for Older Workers Differ by Education? Click here to read the Center’s report and recommendations. 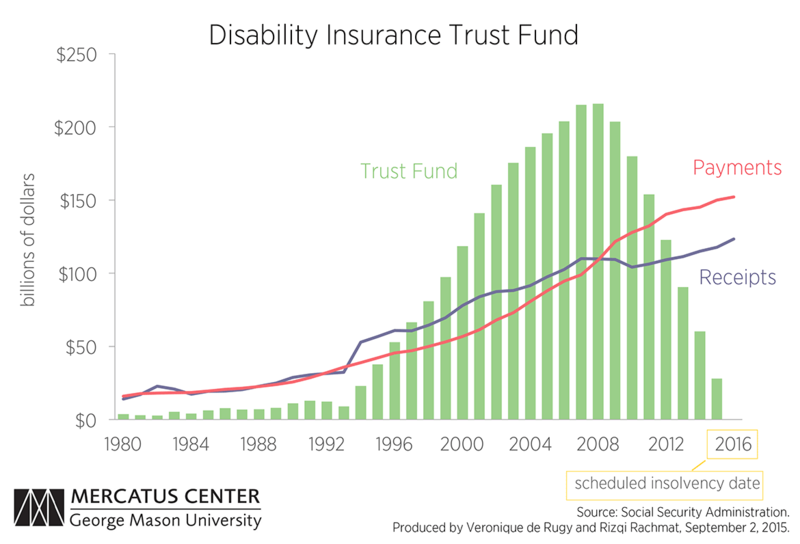 The Committee for a Responsible Federal Budget has a blog post taking on a recent New York Times column from Teresa Tritch on how to address the funding problems of the Social Security Disability Insurance program. You can read Tritch’s original piece here, then CRFB’s response here. Have at it. Taking away inheritances from households that have them reduces the NRRI by less than one percentage point. Inheritances could become more prevalent in the future due to unspent 401(k) balances, but increasing future inheritances has only a minimal effect. If the analysis is limited only to households with inheritances, the impact on the percentage at risk is more substantial. Does Eliminating the Earnings Test Increase Old-Age Poverty of Women? Do Working Conditions at Older Ages Shape the Health Gradient? How Would Social Security Changes Affect Medicare Costs and Seniors' Out-of-Pocket Spending? Who is Easier to Nudge?